Once upon a time there were a number of film venues that showed foreign language, documentary, independent and classic films throughout Chicago. All that’s left in the art house world downtown or near downtown are the Gene Siskel Film Center and the Music Box. While the Siskel was built in 2001 (a wonderful venue in its own right) , the Music Box was built in 1929 and is an historic old movie palace. 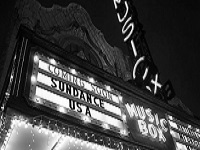 If you’re looking for lower cost films and a unique film viewing experience in an historic theater consider the Music Box. I’ve seen many films there from Gone with the Wind, Lawrence of Arabia to the Sound of Music. These are films I could never have seen anywhere else. The Music Box general admission tickets are $10. In addition there are a number of ways to save, such as the First Show of the Day Discount, matinees, the Monday Special, and the Music Box Discount Card, which offers 5 admissions for only $35.00. Monday Special: $7.00 Admission and buy one, get one popcorn and soda! With the exception of some special presentations, tickets are not sold in advance. The box office accepts cash, Visa and MasterCard. The Music Box Theatre Box Office is open daily from 15 minutes before the first show of the day until 15 minutes after the last show of the day. Save up to $2.25 per admission! Available at the box office or by mail, and purchase online.